The National Trial Lawyers has named Seattle attorney Christopher M. Davis of Davis Law Group, P.S. 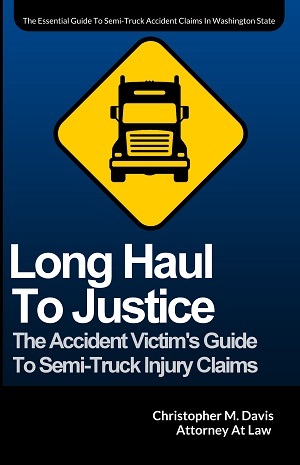 to the Trucking Trial Lawyers Association as one of the Top 10 Trucking Accident Attorneys in Washington state. “It is a great honor to be recognized by The National Trial Lawyers for our efforts at Davis Law Group to represent victims of serious trucking accidents during what is perhaps the most difficult time in their lives,” says Mr. Davis. The National Trial Lawyers only selects trucking accident attorneys who have demonstrated an expert level of knowledge in the area of truck accident cases, based on the above-mentioned criteria. Mr. Davis has represented numerous victims of serious commercial vehicle accidents since founding Davis Law Group, P.S. in 1994, and has extensive trial experience in personal injury and wrongful death cases. The National Trial Lawyers’ nomination of Mr. Davis to the Trucking Trial Lawyers Association recognizes Davis Law Group’s commitment to high-level legal representation for victims of serious trucking accidents in Washington state and throughout the country.